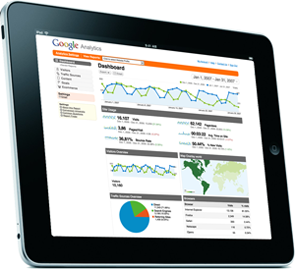 Minds Over Media websites include traffic measurement and interactive reporting for sites powered with Google Analytics. Google Analytics is the enterprise-class web analytics solution that gives you rich insights into your website traffic and marketing effectiveness. Powerful, flexible and easy-to-use features now let you see and analyze your traffic data in an entirely new way. This next generation web analytics tool shows how people find your site, how they navigate through it, and how they become clients. Makes it possible for all advertisers, publishers, and website owners to improve their online results. With Google Analytics you always know your return on investment. Google Analytics provide detailed reports telling your what is working and what isn't, and how to improve your SEO or Adwords campaign.